Last but not least! VSD challenge #4. Kelly hosted this one with a sketch. I used a card kit I had for this one. Supplies are from a card kit, but I added SU papers in Sage Shadow and Bravo Burgundy, sentiment from PTI Birthday Basics, and the image is colored with copics and bic mark its. This is georgous!!! I LOVE this sketch and love the image and colors you used for it. FABULOUS job!!! Isn't she super sweet?! I love your layout & the colors are perfect. Hugs! Oh so cute, she is a sweetie! I received this kit too!! ((Thanks Melina!)) 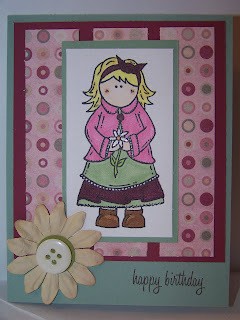 Super cute card, Colleen!! Love the DP.. your colours match so well! You did a great job with that sketch...super cute!